I have two nephews graduating from high school this year. 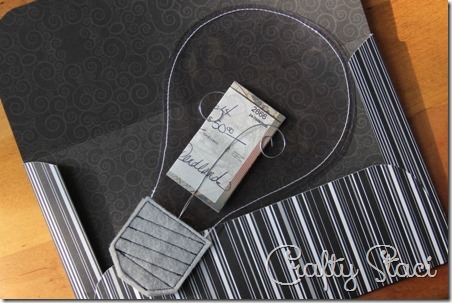 I needed a fun, new idea to present their monetary gifts, then a light bulb appeared. No, literally, there was a light bulb on Pinterest, full of candy. I thought that would be a great for holding the check, but needed it to be flat so I could mail it easily. I wondered if I could sew a light bulb, and it turns out I can. To make one of these, you’ll need some clear vinyl, grey felt and 14” of wire. I used a light gauge wire so it would bend easily. It doesn’t have the label any more, but I’m guessing it’s about 18 or 20. You’ll also need this pattern. 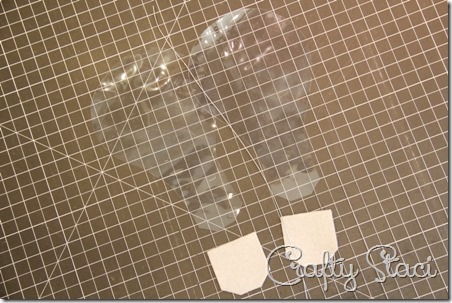 Using the pattern, cut two of the the full light bulb shapes from the vinyl. Cut two of only the bottom portion below the line from the felt, as shown. Fold the wire in half. 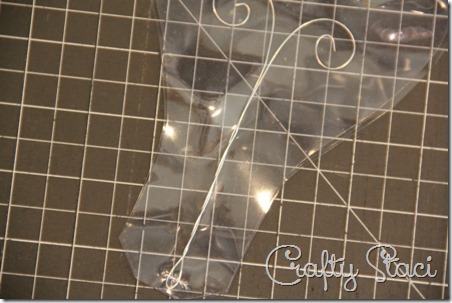 Bend each end into a spirally loop. Sandwich the wire between the two pieces of vinyl. Stitch over the bottom to hold the wire in place through the next steps. Layer the two pieces of felt over the vinyl at the bottom. Stitch around the outside and stitch rows of threading as shown in the photo. Be VERY careful when stitching over the wire. If you hit it with your sewing machine needle it will break. I know this for absolute certain, but only lost one needle making both of these. 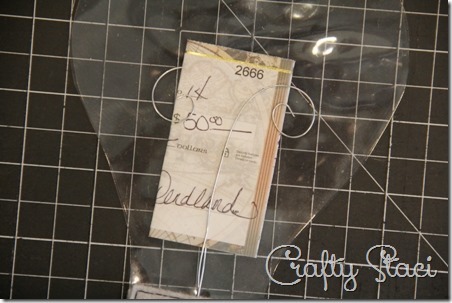 Slip your check or cash inside, using the loops in the filament wire to hold it in place. Stitch around the outside of the bulb. Yes, they do have to remove some stitching to get to the moolah. I kind of like the thought of them spending a little time trying to figure out how to get it out. I made a card to slip this into, which you can download here. It contains the cheesy pun that couldn’t go unspoken. A quick, easy gift to light up the lives of all those graduates!